A touch of nature and natural light can reduce workplace stress and inspire more and better work. And this is not just workplace idealism talking — it’s science. A stunning built-in living sculpture and upper-level windows in the office of a major nonprofit environmental conservation organization shows how lights and plants can be incorporated into sophisticated design. Source: “Every Building Tells A Story”, by JLL. 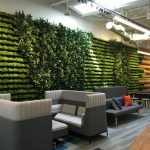 Sunlight and greenery have repeatedly been proven to boost the health, well-being, and productivity of office workers, according to a new World Green Building Council (WGBC) report co-sponsored by JLL. The report reviews decades of research on workplace design and productivity, providing “overwhelming evidence” that creating an office with plentiful natural light and plants is a smart investment. The benefits of natural light are far more than meet the eye. One study cited in the WGBC report found that office workers with windows slept an average of 46 minutes more per night than their windowless colleagues. These employees reported better scores than their counterparts on quality-of-life measures, as well as better outcomes on measures of overall sleep quality, sleep efficiency, sleep disturbances, and daytime dysfunction, which dramatically impact overall employee productivity. Natural light is not just for the privileged few in Kemira’s Atlanta offices, where nearly everyone is near a window. Source: “Every Building Tells A Story”, by JLL. Designing a workplace to maximize workers’ access to natural light can improve employee productivity while trimming the electric bill. However, even older buildings can often be reconfigured to improve daylighting. For example, several well-windowed offices can be combined into a communal collaboration lounge so that office workers whose desks are in dim corners have access to open space and natural light. Portable screens can be used to create private areas within the communal space as needed, while still providing opportunity for collaborative work. Daylight isn’t the only natural element that inspires productivity. What lies beyond is also important: views of the world outside. The WGBC report cites several studies in the last decade that found productivity gains as a result of proximity to windows. And, the findings suggest that the view outside the window may be even more significant than the daylight that illuminates it. Outdoor views—or even expansive indoor views—provide visual breaks that can help keep the mind limber and open to possibilities, and can also help relieve stress. Natural landscapes are most beneficial, but a cityscape also provides visual stimulation and can fire the imagination. Lively flowers brighten the cafeteria at Epsilon’s San Francisco’s offices. Source: “Every Building Tells A Story”, by JLL. While views of a dense forest or well-tended garden may not always be available, simple proximity to indoor plants is valuable in itself. Chalk it up to biophilia—the concept that humans have an instinctive bond with other living things. A plant—yes, a live plant—can help lower office stress, improve cognitive function and enhance creativity. Elaborate landscaping is not essential, as even a simple potted plant or container garden can provide biophilia benefits. Also noteworthy, indoor plants double as air quality controllers. The WGBC report found numerous studies showing that high levels of carbon dioxide and volatile organic compounds (VOCs) make employees tired and less able to think clearly. Case in point? A 2011 lab test mimicking an office with high levels of VOCs found that increasing ventilation improved workplace performance by eight percent. As nature’s best air filters, plants can clean up the air to improve employee function and ultimately support productivity goals, too. It’s become increasingly obvious that elements of nature can improve energy, focus and productivity across the office. While some green and light elements may require significant investment in office redesign, the good news is that even modest improvements to the office environment can improve absenteeism rates, fuel greater creativity and inspire a more focused workforce. It’s also promising that new practices in measuring how and whether green workplace investments are improving productivity, such as JLL’s Green+Productive application and methodology, now make it easier to identify which investments are most worth making. For now, invest in some attractive potted plants and sit back and watch the corporate mood lift.